The most magnificent view of Longs Peak to be found. Your magnificent view of Longs Peak from this cabin! Welcome to Longs Peak Lookout Cabin! See-through wood fireplace warms both Living and Dining Rooms. Comfy seating to hang out with a good book in front of the fire. Perfect for a nap post-hike. From the living room, a 2 seater bar allows chatting with the cook! Keep the cook company at the bar! The country kitchen opens to the rustic living room. Modern appliances to keep your experience homelike. Can you imagine breakfast in this quaint country kitchen? The Dining Room opens to a large deck with sweeping mountain views! The Master Bedroom with the en-suite Master Bath just beyond. The Master Bedroom opens to a spacious deck with Longs Peak views! Lovely Master Bath has walk-in closet and stacked washer/dryer just beyond. Sleep snug as a bug in these twin beds. The third bedroom offers these great twin beds. Full bathroom conveniently located between second and third bedrooms. This full bath is located between the second and third bedrooms. The second Bedroom offers this convenient tuck-away bed. Spacious deck offers huge views of Longs Peak. The spacious deck across the back of the cabin. To finish this picture, all you need is a glass of wine, a good book and YOU! This deck stretches across the entire back of the cabin. What to look for when you drive up to Long's Peak Lookout! Longs Peak in all its glory! ALLERGY ALERT! Guests with pet allergies note the owners have had their dog in this cabin. Getting around It is less than 1/2 mile to the boundary of Rocky Mountain National Park. Downtown Estes Park is three miles away. Easy access to restaurants, grocery store, laundromat and fun activities like miniature golf, trout fishing, Fun City and more! Welcome to Longs Peak Lookout Cabin! It's within walking distance to the south entrance of Rocky Mountain National Park. Originally, this cabin was located in Rocky and has been lovingly remodeled to maintain its rustic charm. You'll feel the heritage, history, and legacy when you enter this delightful cabin. This spacious 3 bedroom, 2 bath home sleeps 6 and is one level. You will love relaxing on the spacious deck with its stunning views of Longs Peak and the Continental Divide peaks. Smell the pines, drink in the view, then step back inside to the dining room that shares a see through wood burning fireplace with the cozy living area. Wood details throughout the cabin adds to the rich mountain feel. The living room is full of mountain charm from the double sided fireplace to the rich rugs and decor. The country kitchen is large enough for a family to cook while the guests hang out in the living area or at the bar. You can breakfast at the vintage pine table in the kitchen or move to the deck for your morning coffee. 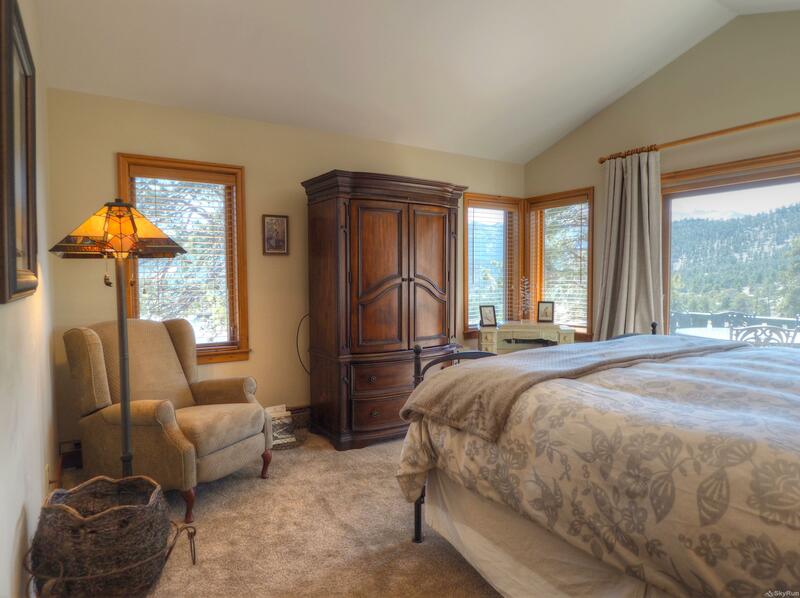 The Master Bedroom features a king bed complete with a magnificent mountain view from sliding glass doors to the deck. The Master Bath has been renovated with a walk-in shower. Just beyond the Master Bathroom is a walk-in closet with a stacked washer and dryer for your convenience. On the west side of the cabin are two more bedrooms. The second bedroom offers twin beds and more vintage knotty pine furniture. A full bathroom has a shower/tub combo and is located between the second and third bedrooms. The third bedroom features a queen Murphy bed and a desk area. The cabin is light and bright with many windows and an open floor plan. You may park in the driveway. Download the SkyRun app for info on Estes Park events and a multitude of things to do during your stay. Downtown shops, groceries, and outdoor activities are all within 1-3 miles driving distance. Reserve Longs Peak Lookout today and begin planning the unforgettable memories! Getting around: It is less than 1/2 mile to the boundary of Rocky Mountain National Park. Downtown Estes Park is three miles away. Easy access to restaurants, grocery store, laundromat and fun activities like miniature golf, trout fishing, Fun City and more!